It's incumbent on all of us to really get loud. Write, make phone calls and email. We can't let this happen. The entire unemployed community is being ignored to the point that people don't really believe we exist or that the problem is as large as it is. 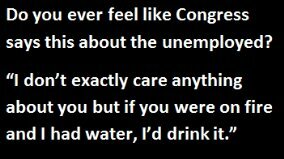 Sadly, it isn't just Congress who feels this way. Public apathy towards the unemployed is running rampant. People will not acknowledge it out of fear it will happen to them. Let's work together to spread awareness and let the world know WE WANT TO WORK! !